Hello. Do you like words? Especially when they’re all smashed together to form thoughts? And what about when those thoughts are entertaining and heartfelt? If so, then have I got a blog post for you! I contributed a story about a bachelor party I planned, and ruined, to a new book titled REJECTED: Tales of the Failed, Dumped, and Canceled, which comes out next week. Thankfully, this being the Internet, you can even pre-order a copy right now. And if you are going to be in the NYC area next Tuesday, January 27th, I’ll be reading my contribution to the book at The Bell House in Brooklyn for the REJECTED launch party/live show. Some of the other scheduled performers include David Wain, David Rees, Mike Albo, Dave Hill, Odd Todd, Sara Schaefer, Tom McCaffrey, Katina Corrao–plus, live music from THE DEFIBULATORS. 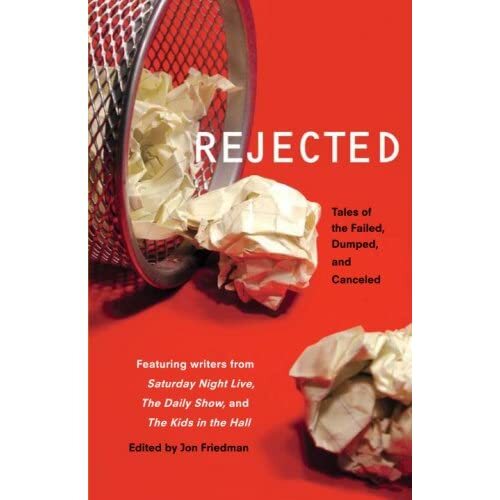 The event will be hosted by the creator of The Rejection Show and the editor of this anthology, Jon Friedman. I co-authored this book, which Publishers Weekly called "a hilarious and addictive page-turner." If you'd like to call it things, too, you can buy it. people are keeping up to date with me on Facebook, you should too! THERE ARE SO MANY WAYS TO STAY IN TOUCH. Twitter Facebook Flickr COPYRIGHT 2019 TODD LEVIN. Please don't steal!